about assignment of comrade Joseph Vissarionovich Stalin title of HERO of SOCIALIST LABOUR. 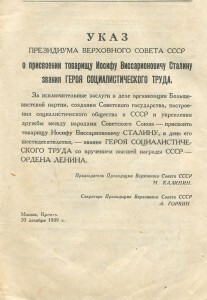 For exclusive services in the organization of the Bolshevik party, the creation of the Soviet state, the construction of socialist society in the Soviet Union and strengthening of friendship between peoples of the Soviet Union – assign comrade Joseph Vissarionovich STALIN, on the day of his sixtieth year, HERO of SOCIALISTIC LABOR with the highest award of the USSR ORDER of LENIN. 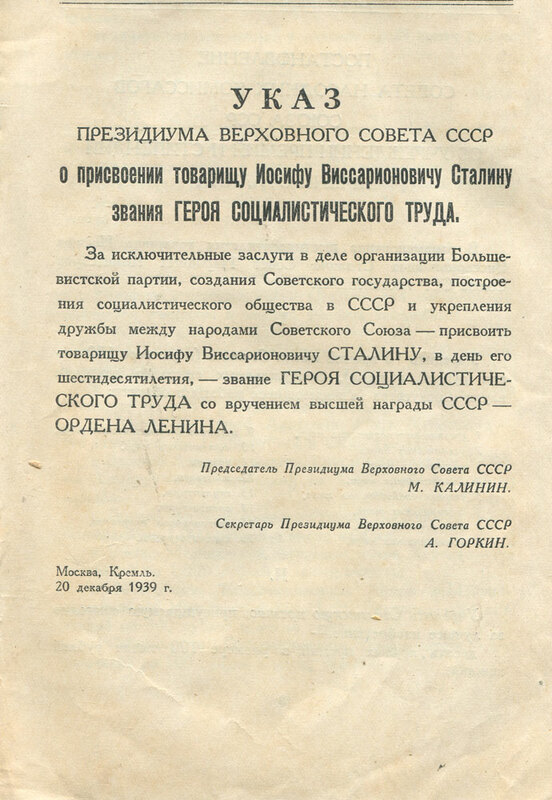 RESOLUTION OF THE COUNCIL OF PEOPLE’S COMMISSARS OF THE UNION OF SOVIET SOCIALIST REPUBLICS ON THE ESTABLISHMENT OF AWARDS AND SCHOLARSHIPS NAMED AFTER STALINRussia, Nizhny Novgorod region, Nizhny Novgorod, Big Cave Street 40 The original solution of the facade.